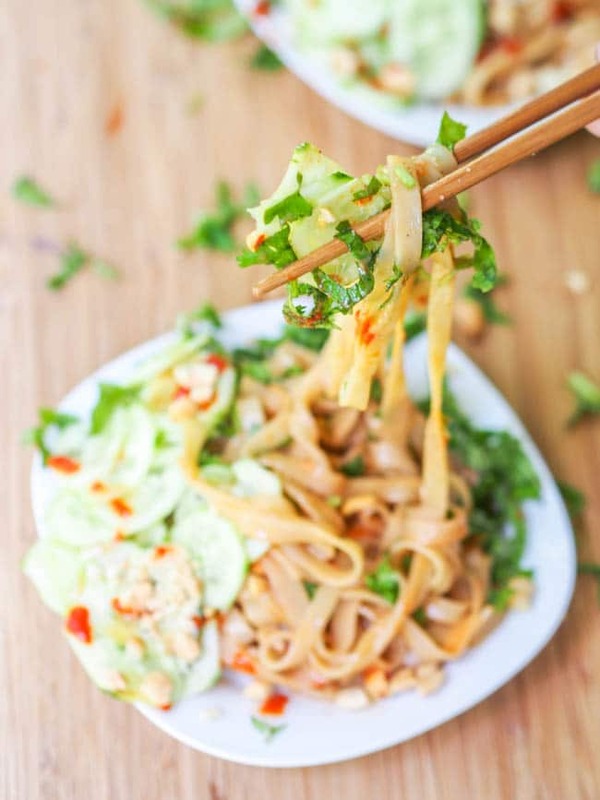 Asian vegan sesame noodles salad with cucumber and herbs makes for a perfect 20 minute quick summer meal. Perfect served cold and refreshing with the crunchy cucumbers, fragrant herbs and silky smooth spicy sesame and peanut butter dressing. Aside from seafood, I’ve been craving noodles lately. Asian noodles. A rich and thick creamy sauce with a hint of sesame oil and tamari. Yes, that is exactly what was in store for me this afternoon. After an incredible 30 minute helicopter tour around Boston, with D, this afternoon (during which we even got to see Tom Brady’s house, or should I say compound) it was time to treat myself to a simple yet proper lunch. Noodles were in order. I had just recently seen a similar recipe on Smitten Kitchen, so which that in my mind I quickly whipped up this dish. Instead of going the simple route, and whisking all the sauce ingredients together within minutes, I decided to make my own tahini paste as well. Why not right? Well to be fair I didn’t have any on hand, couldn’t be bothered to drive to the store, and the prospect of making my own out of roasted sesame seeds seemed mildly exciting. Gotta love watching that food processor hard at work. Agree or disagree? 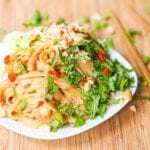 So while that was whirring everything into a rich and creamy paste I prepped the rest of the ingredients in this vegan sesame noodles salad recipe and boiled the noodles. Do not, I repeat do not overcook rice noodles. Mushy mush mush is all you’re going to be left with. Set that timer and taste test periodically. If you’re going with the store bought tahini you’ll whip this up even quicker than I did. 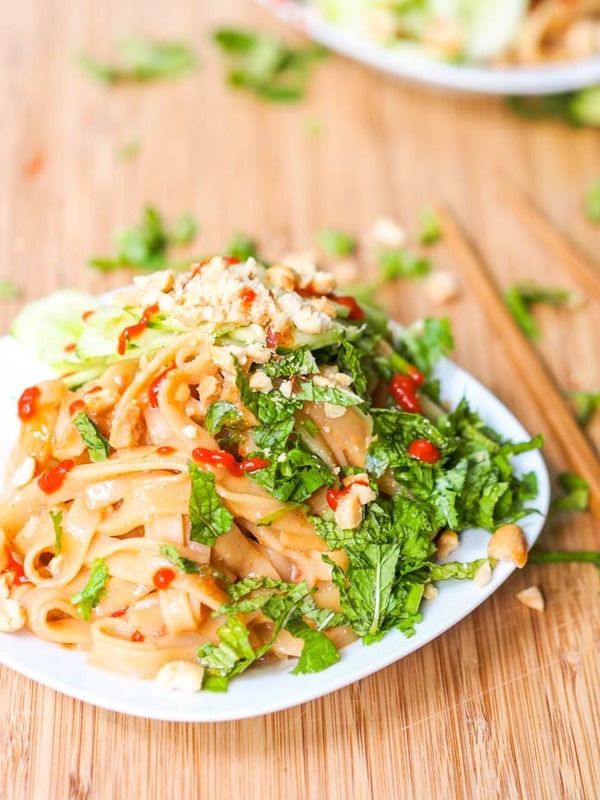 The goal here is to have a light cold and refreshing summer noodle salad. Cucumbers, cilantro and mint just ooze summer happy days so this are perfect toppings for the creamy vegan sesame noodles salad. 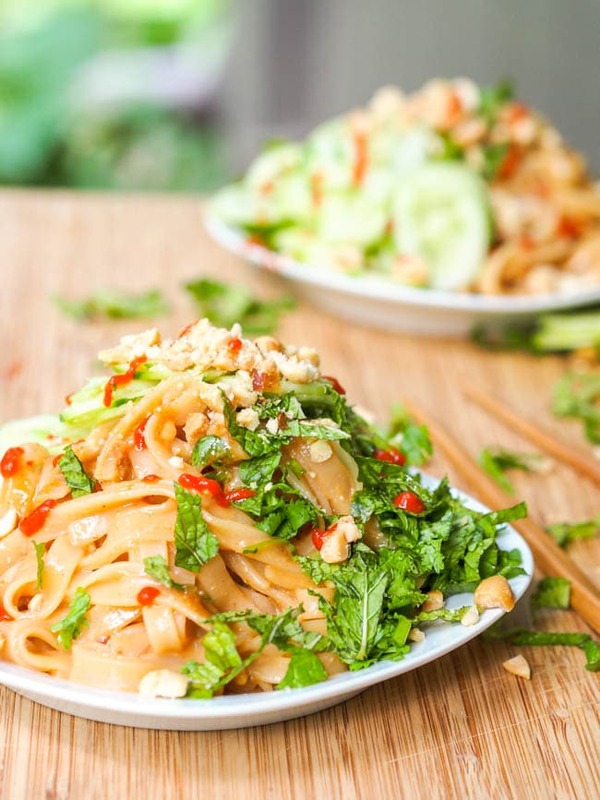 The sauce for this Asian vegan sesame noodles salad is just perfect – tahini, peanut butter, tamari, rice vinegar, ginger, sesame oil — the whole gang’s here. Mix it all up and slurp away. I gobbled up my portion in about 45 seconds flat — and I did deliberately choose to eat with chopsticks to at least slow myself down a bit. My mom was a huge fan too. We both enjoyed this vegan sesame noodles salad as our mid afternoon Sunday summer lunch. Light, quick, and most of all healthy. Gluten-Free and Vegan too. Asian sesame noodles Salad with cucumber and herbs make for a perfect 20 minute quick summer meal. Perfect served cold and refreshing with the crunchy cucumbers, fragrant herbs and silky smooth spicy sesame and peanut butter dressing. 8 ounces dried rice noodles thickness of pad thai noodles, cooked according to package directions and rinsed in cold water, then drained. Toss noodles with 1/2 tablespoon sesame oil. In a bowl combine the dressing ingredients - 2 tablespoons sesame oil, sesame paste, peanut butter, tamari, rice vinegar, agave, ginger and chili garlic paste. Mix until smooth. In a large bowl combine noodles and sauce, tossing until combined. Plate noodles and top with cucumbers, cilantro, mint and sesame seeds. This looks so easy! 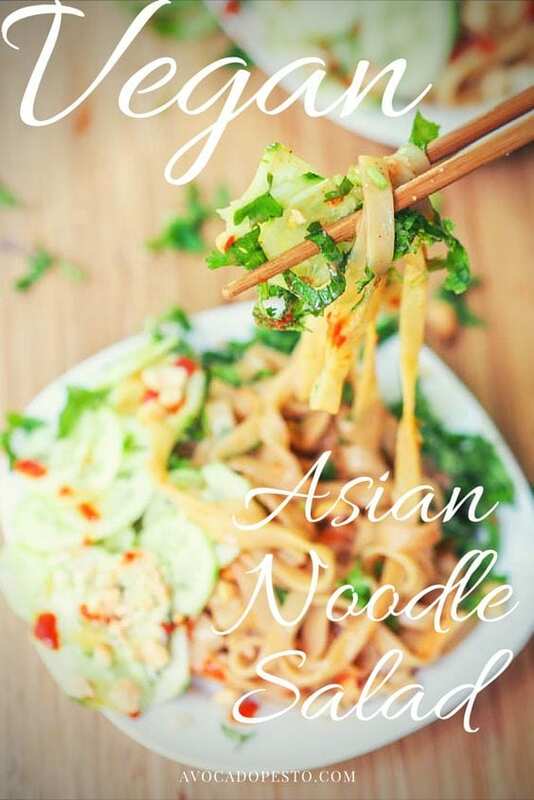 I love making this Noodles Salad.